The Rovin' Flames performing live in the bed of a truck in Downtown Tampa, Florida, at the Soap Box Derby Parade on July 13, 1968. The names of the members are written at the bottom. 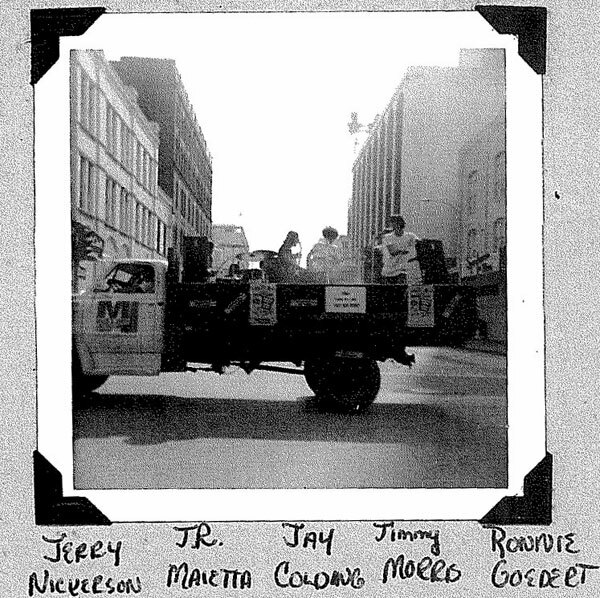 From left to right, they are listed as Jerry Nickerson, J. R. Maietta, Jay Colding, Jimmy Morris, and Ronnie Goedert. The Rovin' Flames were formed in Tampa in 1965 by Paul Battle (rhythm guitar and vocals), Jimmy "Mouse" Morris (lead guitar), J. R. Maietta (bass) and Jerry Goff (drums). They recorded "Gloria/J.J.J.P." in September 1965 on Fuller Records and recorded their second record, "I Can't/I'm Afraid to Go Home," on Boss records in March of 1966. Hardy Dial, from The Outsiders/Soul Trippers, was added on lead vocals in the summer of 1966, and the group recorded "Bo Diddley/Seven Million People" in June of 1966. Battle, Goff, and Dial left the group in September of 1966 and were replaced by Jim Davis (vocals), Davy Tabak (drums) and John Rogers (organ). Davis left in December of 1966 and Battle briefly returned as lead vocalist, before being replaced by John DeLise, also of The Outsiders/Soul Trippers, in February of 1967. The group replaced Tabak with Eddie Taylor on drums in July of 1967, and recorded "How Many Times/Love Song No. 6" in September of 1967 on Decca Records. Although DeLise lasted longer than most of the band's lead vocalists, he left the group in less than a year, being replaced by Bob Thompson in November of 1967. Rogers passed away in March of 1968, and Thompson and Taylor left the group, being replaced by Jay Colding (organ), Jerry Nickerson (drums) and Ronnie Goedert (lead vocals), in July of 1968. Goedert left shortly thereafter in the fall of 1968, and was replaced by Hobie O'Brien, who remained the lead vocalist until the band broke up in January or February of 1969. Original black and white photograph, July 13, 1968: Profiles: Bands & Artists, Tampa Bay Music Scene Historical Society. Digital reproduction of original black and white photograph, July 13, 1968. http://www.tampabaymusichistory.com/resources/RovinFlamesSoapBoxDerbyParade1968July13b.jpg. Joynson, Vernon. Fuzz, Acid and Flowers: A Comprehensive Guide to American Garage, Psychedelic and Hippie Rock (1964-1975) : (Includes Rarity/Sought-After Scale and Compilation Listings). Glasgow: Borderline, 1997. “The Rovin' Flames at a Soap Box Derby Parade.” RICHES of Central Florida accessed April 18, 2019, https://richesmi.cah.ucf.edu/omeka/items/show/5497.